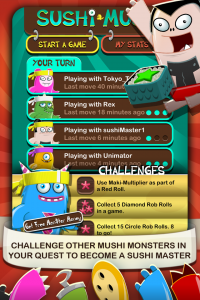 AUSTIN, Texas – Nov. 1, 2012 – Aspyr Media today announced Sushi Mushi, a new multiplayer match-3 puzzle game available November 8 for all iOS devices. 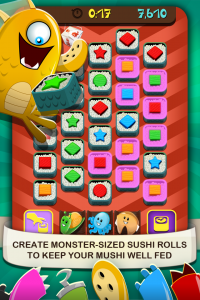 A fresh addition to the genre, Sushi Mushi will task players with creating sushi rolls to feed their hungry monsters. With loveable characters, smooth animations, and catchy music, Sushi Mushi will take fans of the puzzle genres by sushi storm. In Sushi Mushi, players will pick a monster and play against others to create sushi rolls, feeding their character as many rolls as possible. Gamers will create rolls by matching sushi bites according to color or shape. Advanced moves will utilize offensive and defensive rolls for bonuses, helping gain even higher scores. The player who scores the most points from their sushi roll creations by the end of three rounds will be crowned the victor. Sushi Mushi utilizes asynchronous multiplayer and will feature Facebook Connect, letting players battle against friends and family whenever they want. Gamers can also play solo in the single-player snack mode to hone their culinary skills and achieve new Challenges. As players progress with their monster, they will gain new belt levels and collect Bento Buddies, furthering their massive sushi monster success. Aspyr media has released a short preview trailer for the game. Sharpen your claws and check it out here: http://www.youtube.com/watch?v=J04nSdT4taw&feature=youtu.be.